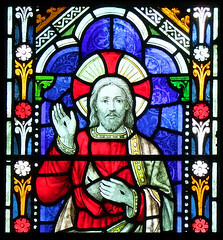 The grand Beccles church of St Benedict vies with Bungay St Edmund and Lowestoft Our Lady Star of the Sea for the title of Suffolk's most spectacular Catholic church. And yet, they are all very different. St Edmund is jewel-like, while Star of the Sea is a palace of delights, an Arts and Crafts movement treasure box. 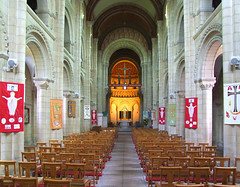 St Benedict is something grander than both, more austere; an articulate French Romanesque revival that has been admired by many who tend to be sniffy about the early 20th century. 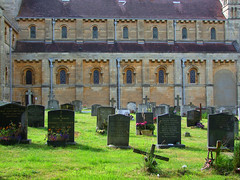 St Benedict sits on a hill in the south of the town, surrounded by its own graveyard. 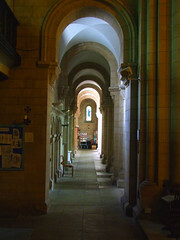 Norman arches clamber and interlock to form clerestories and triforia; a bold apse extends beyond the solid four-square tower. Topping it all off is the grand west front facing the main road. The architect was Frederick Banham, a local man, and the project was bankrolled by the Kenyons of nearby Gillingham Hall, across the border in Norfolk. 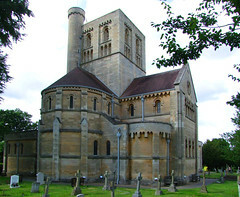 The building was erected between 1900 and 1908, and was planned as the minster church of a large priory. An earlier church survives, now the parish hall. 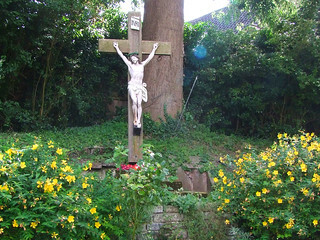 Banham was himself a Catholic, and is buried in the graveyard here beside his young son, who died during the period in which Banham was building the church. 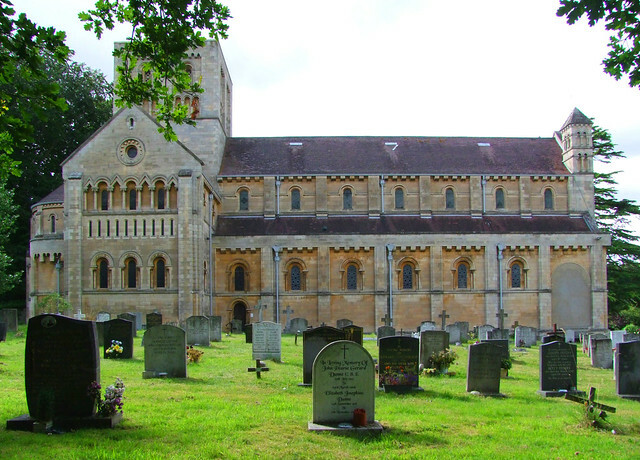 Although the Benedictines never came in force, the church was served until the 1970s by the monks of Downside Abbey, and links are still maintained. Perhaps because of this, it doesn't feel like an East Anglian church at all, and seems most exotic in one of the busy little Waveney Valley market towns. 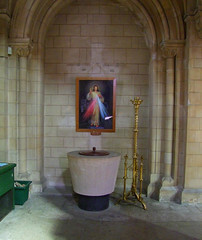 Inside, the ambulatory around the nave contains the Stations of the Cross, and enhances the sense of solidity. 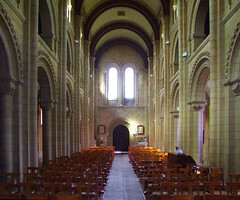 It is easy to imagine the monks processing around the church. Above, the triforium lifts the eye heavenwards, and light infuses the building from the liturgical east (actually south). 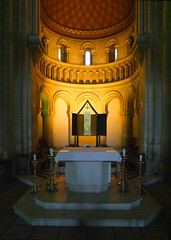 Since Vatican II, the altar has been moved forward from the apse to beneath the crossing. Eric Stevenson's startlingly modernist tabernacle of 1973 stands behind it. 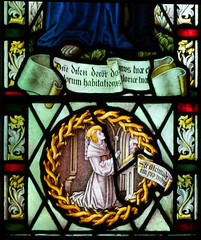 In Banham's plan, stained glass was used sparingly and effectively, the work of Shrigley & Hunt. 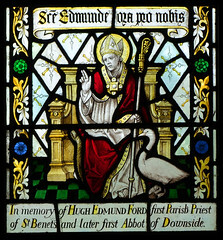 One window shows Hugh Edmund Forde who was first Parish Priest of St Bene'ts and later first Abbot of Downside. 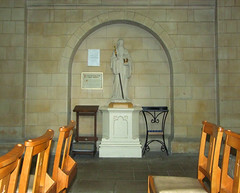 It depicts him with his real face, and St Hugh of Lincoln sits with his swan beneath him. 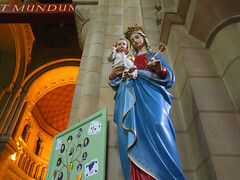 Forde may have been the first Catholic Priest at St Benedict, but of course Catholic priests ministered at St Michael in the market square before the Reformation, although very little of the church from their time survives there. 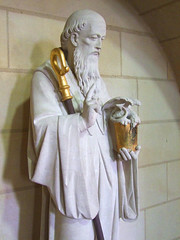 But St Benedict harks back to an earlier age than that of St Michael. The vaulted roof is far off in the gloom. The inscription on the rood reads Sic Deus Dilexit Mundum, 'God so Loved the World'. All of Suffolk's churches would have had a rood before the Reformation, so we are in the presence of a continuity. 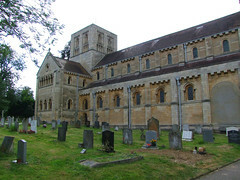 The Romanesque style, with its cruciform shape and central tower, was virtually eradicated in Suffolk by the wealth of 15th century Perpendicular rebuilding. But it reaches across the void of centuries, reconciling us to what the English Church once was.